This cute little gift book contains about fifty inspirational thoughts that are uplifting and empowering, encouraging the reader to be his best self. They are accompanied by whimsical and pastel-coloured illustrations by Amanda Cass. This is a book that makes one reflect, and the messages will help the person who has suffered judgement, has been put down, has been or going through great obstacles in life, has fears holding them back, is down in life and so forth. I think everyone can relate to these positive thoughts. remember where and how it felt. Tomorrow, take a different path. and the lessons we gain. This collection of positive messages would make a great gift for anyone who may be going through a rough spell, even young ones and especially teens. Or perhaps for that friend who has been there for you, that co-worker who is helpful to everyone, or that person who always knows what to say to cheer you up. The book is attractive and could be left on a coffee table where it is sure to be picked up, leaving the reader with thoughts on which to ponder and meditate. 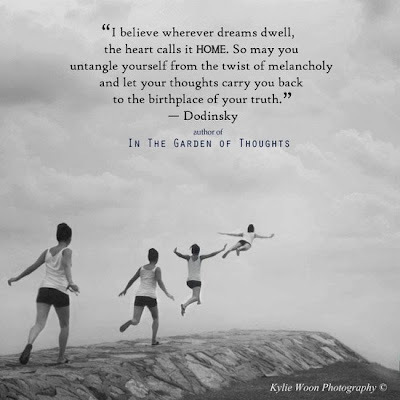 Join Dodinsky on Facebook where a community of 175,000 people share their own stories. Join the March of Positivity! Here's an inspirational message for you. Sourcebooks has kindly offered to give away a poster and signed bookmark. Leave a comment stating why you want to win the poster and bookmark. Include an email address. If you do not include an email address your entry will not be valid. *Giveaway ends April 16, 2013.